Innovative direct box with Bluetooth connectivity. 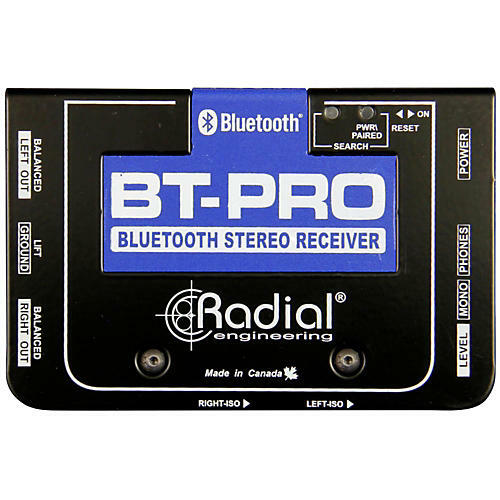 The BT-Pro is a Bluetooth direct box designed to capture the wireless transmission from a Bluetooth enabled device and convert the signal to a balanced line for use in a PA or recording system. It employs an innovative T-shaped access cavity behind which is located the antenna. This is protected by a milled insert made from Sintra® – a rugged closed-cell PVC - that permits the wireless transmission signal to pass without interference, allowing reception distances of 12 meters (40') or more with line of sight between devices. The power of Bluetooth compatibility in a DI box, order BT-Pro today!